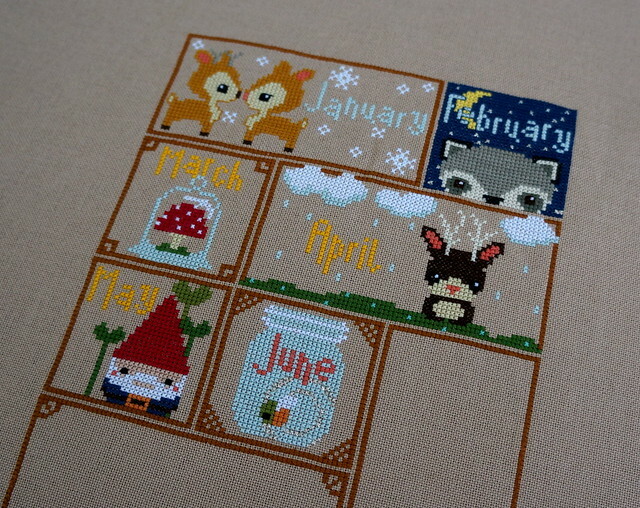 The last few months of the Woodland Sampler have been absolutely adorable. 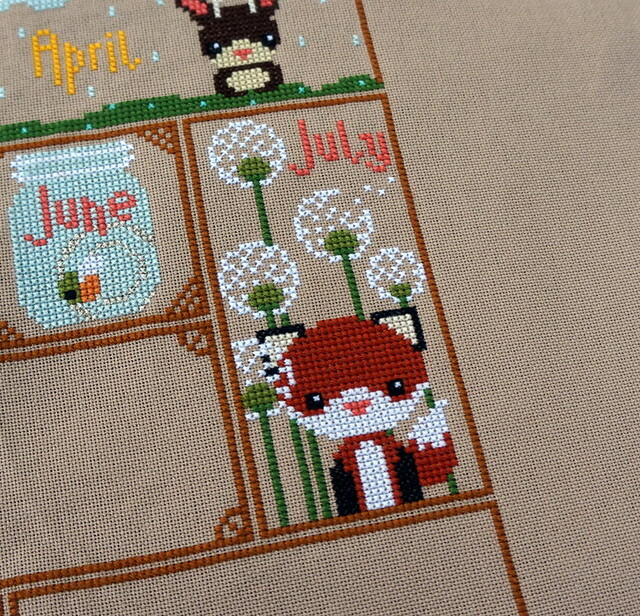 July was Francie the Wishful Fox, surrounded by dandelions. 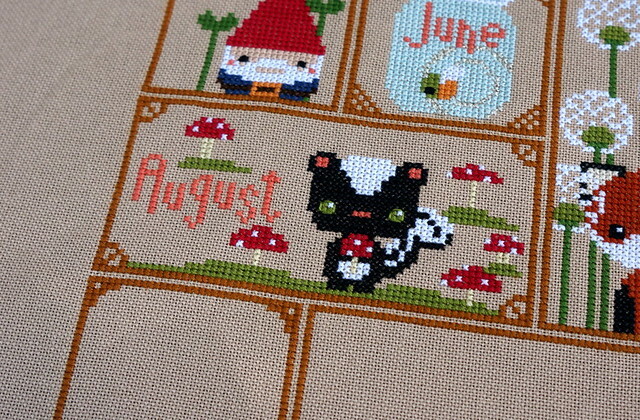 August was Pierre the Mushroom-Collecting Skunk. And the overall progress so far. I'm really loving how everything looks together. 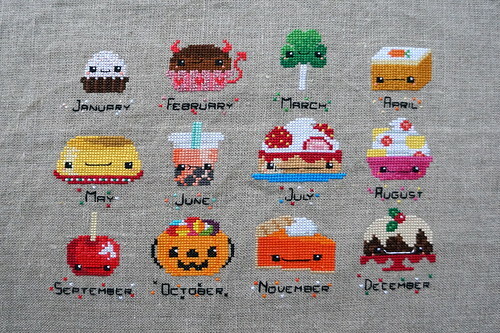 You really feel like you're moving through the seasons as you look through the months! 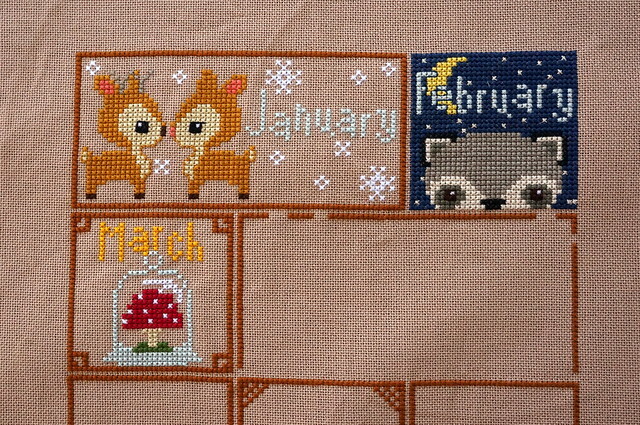 I've been slowly but surely keeping up with the Woodland Sampler Stitch-along, but not so much keeping up with sharing my progress. Here's June - a Little Lightning Bug! He's in a mason jar, lighting up his surroundings with sparkly light! I'm really loving the colors going on in the entire project. 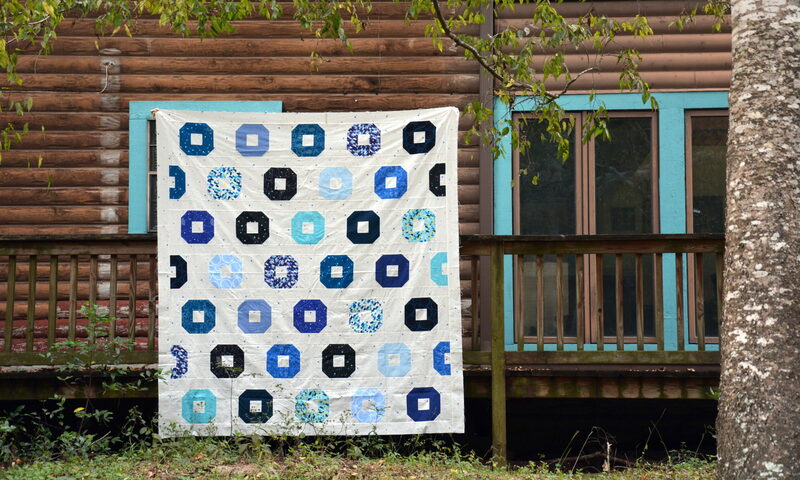 This is going to be really fun to have hanging on the wall when it's done! Well that was a bit of a break, no? Sorry for the brief absence; over the last few months we've been in the process of moving, and we've finally moved into our new house! Wait until I show you my new sewing room (yes room, an entire room to myself!). It's awesome. 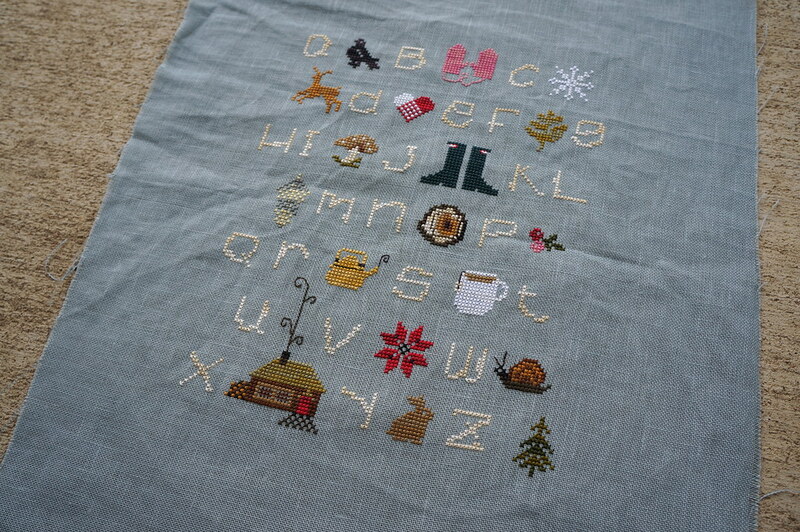 Anyway, in my very brief downtime, I've been doing a little bit of stitching. 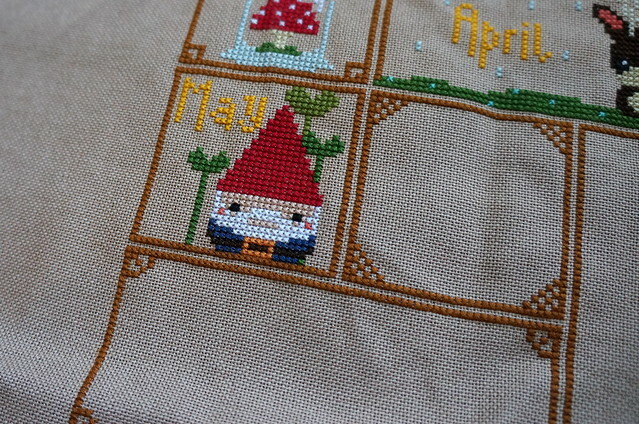 and Mr. Gnomey and the Sprout Gang. Too cute, right? I absolutely love the rain in the April block, and how the clouds move in front of the border! 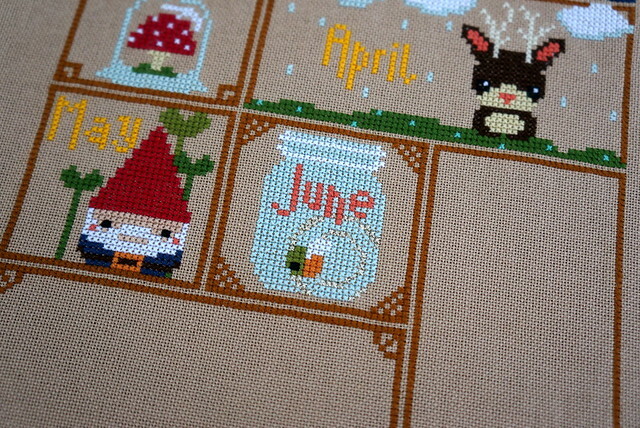 Now it's time to finish June! Let's pretend it's still March, shall we? 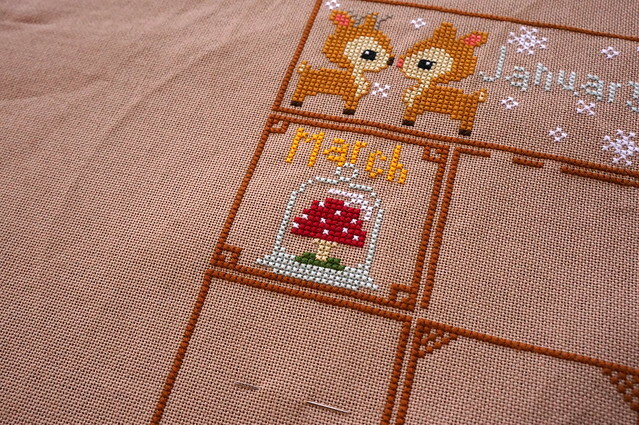 Here's Marchy McMushroom, the March installment of the Woodland Sampler at The Frosted Pumpkin Stitchery. He's hanging out in a little terrarium! And my progress thus far. 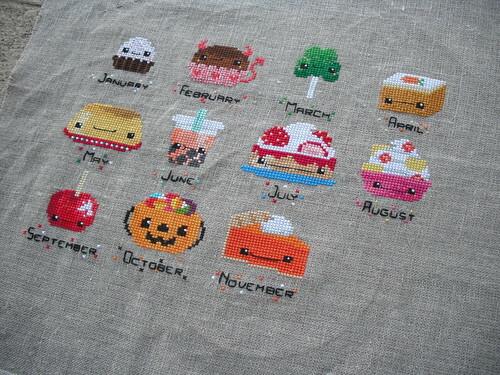 I hope I'll be able to start on April soon! 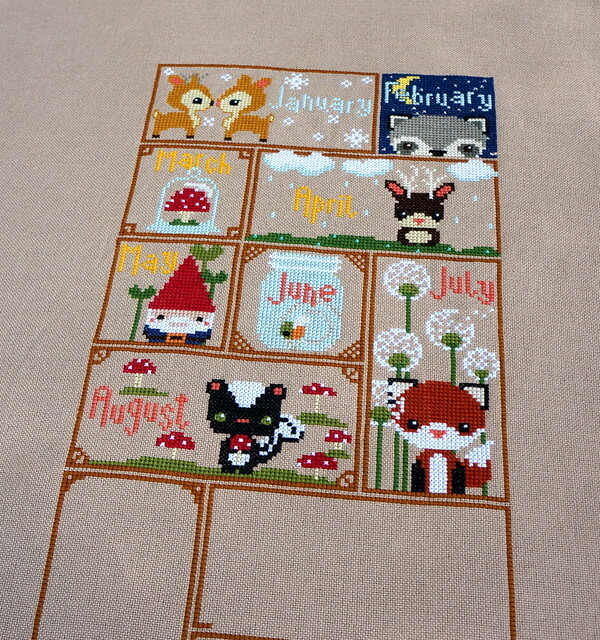 I started on the Woodland Sampler at The Frosted Pumpkin Stitchery, but I forgot to share pictures with you! 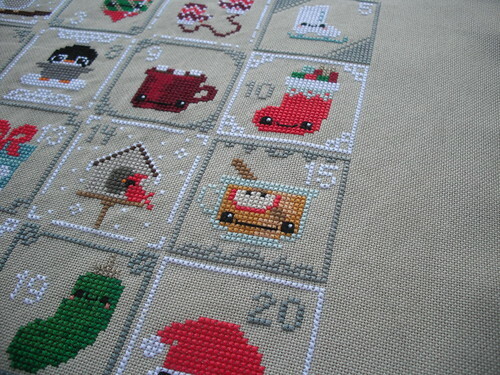 This is the new monthly stitch-along, like the dessert stitch-along I did last year. Here's what I've done so far. And please pardon my lack of ironing! 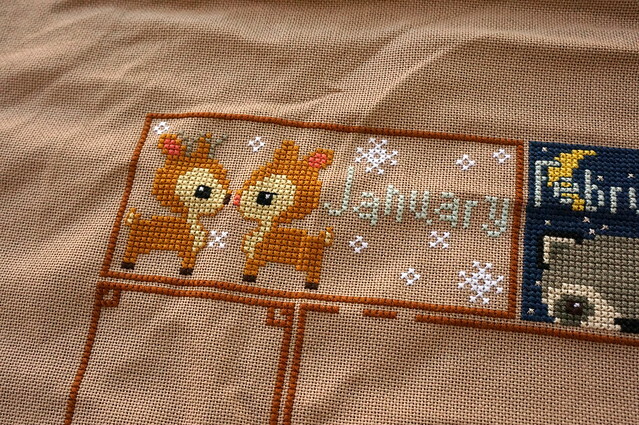 January's pattern is a snowy deer couple. Aren't they the cutest thing ever? 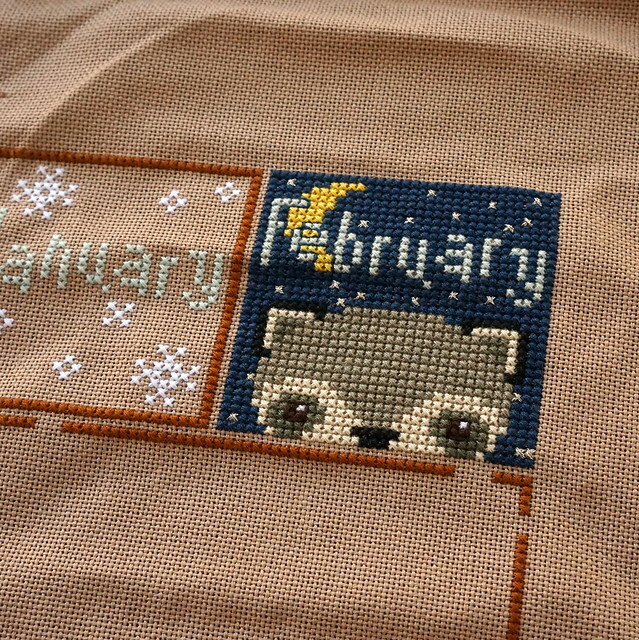 February is a midnight raccoon bandit. It's hard to tell by the picture, but the stars are actually sparkly silver thread! Here is my progress so far. 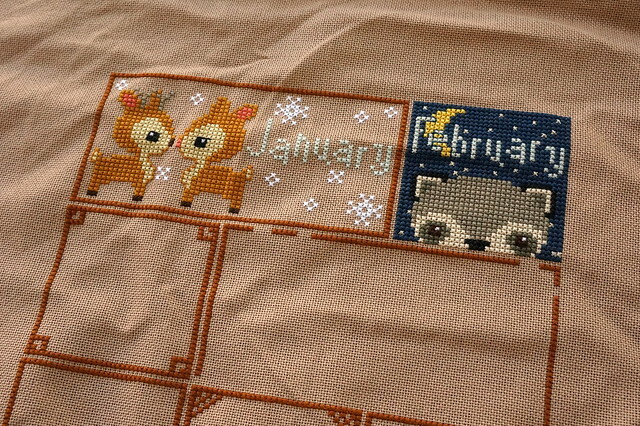 I'm going to start March soon, and I have almost all of the frames done for the rest of the year. 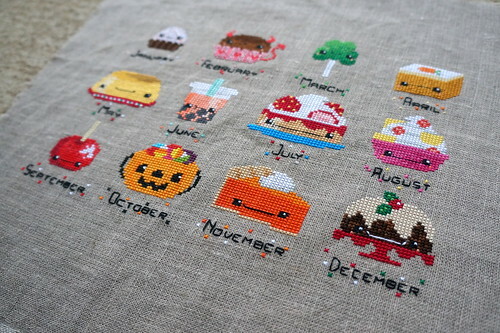 I really love stitching these little patterns every month! 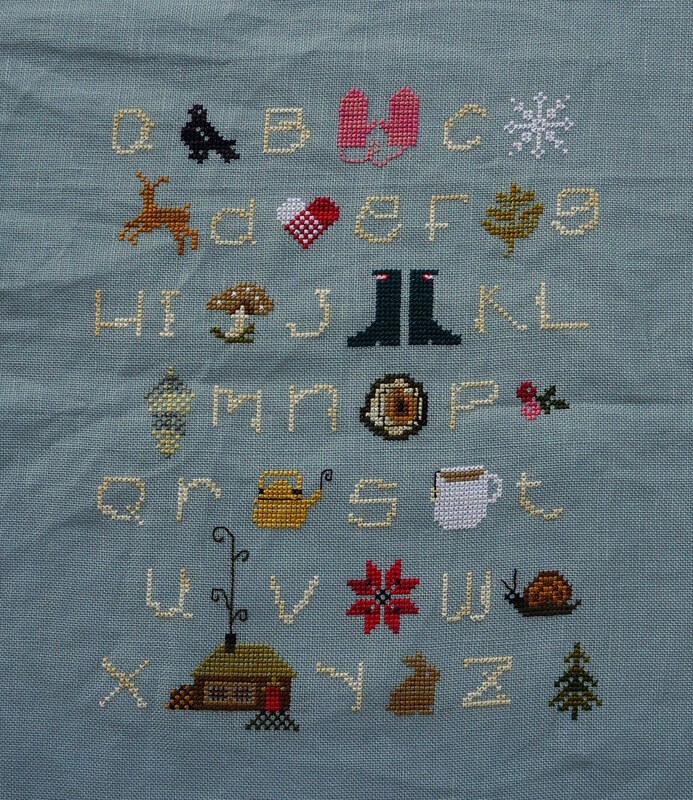 I finished my Winterwoods ABC sampler! 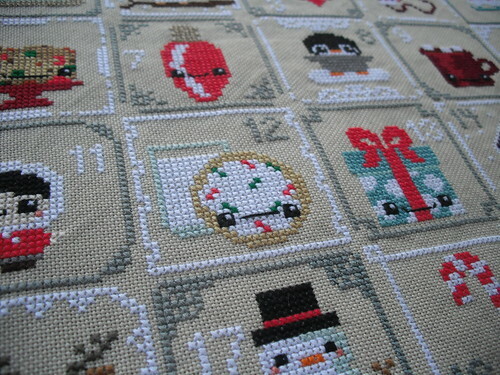 This is a good pattern for someone new to cross-stitch; it's very quick to stitch up. 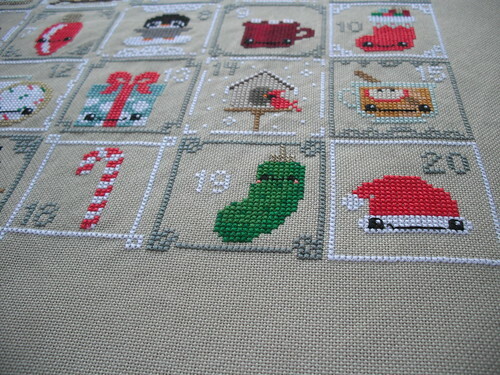 It was fun to use variegated thread too, since I usually use plain DMC. 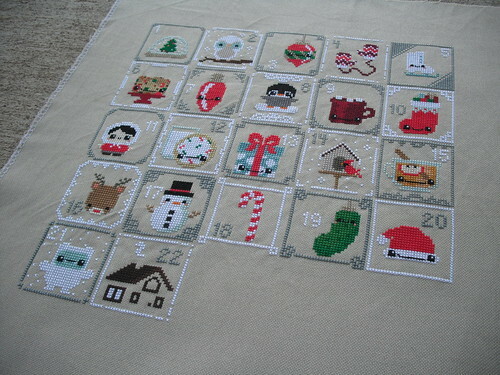 My favorite parts are the star block, the mittens, the snowflake, and the rainboots. I can't wait to get this framed and up on the wall! I seriously love it. 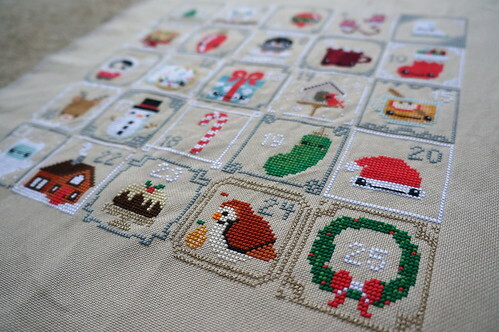 Minus a stitch that I'm missing on my partridge, it's all ready to be hung! All done! 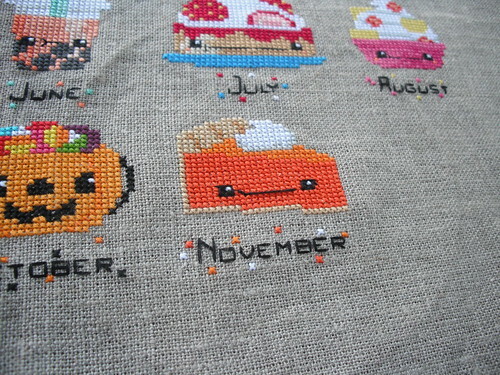 Here's my finished dessert stitch-along (pattern from The Frosted Pumpkin Stitchery). Aren't they cute? 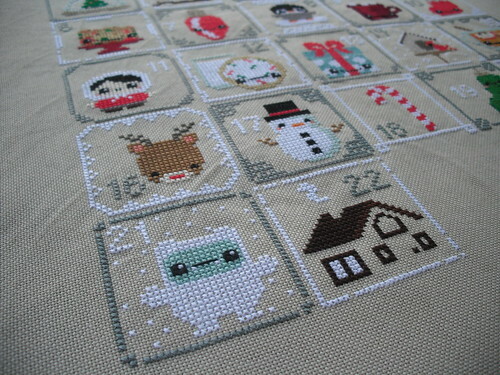 This was one of my first monthly stitch-alongs, and I managed to stay mostly caught up on it. 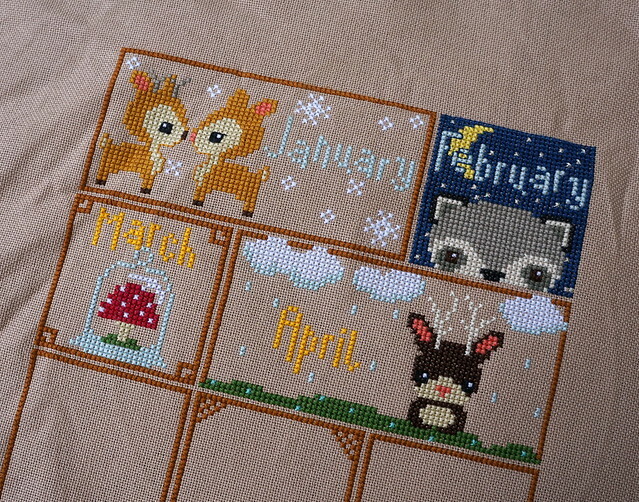 It was fun to see everything revealed month by month! Now I just have to find the perfect frame for it! 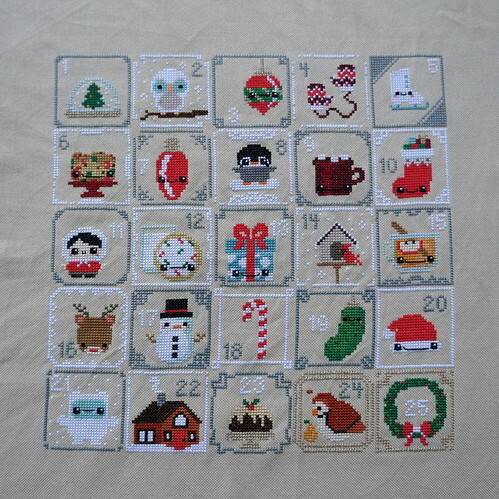 Day 12, milk and cookies. Day 21, a yeti! Stay tuned for the finish!